At Rx, Wilmington’s pharmacy-turned-restaurant, the atmosphere is modern, but the food philosophy is as old as Southern cooking itself. Doss, the managing partner of Rx and its sister restaurant, Pembroke’s in midtown Wilmington, says he has come to work this evening to “play” with the potato roll recipe, hoping he might find a place on the menu for a taste of his grandmother’s legacy. While his kitchen staff hustles through the evening’s dinner orders of speckled trout, rib eyes, and pan-roasted guinea hen, Doss occupies a corner between the meat grinder and the dishwasher. He measures the salt, sugar, and butter, then cracks a couple of eggs and makes a quick conversion to teaspoons from his grandmother’s call for that “pack” of yeast. All around him, cooks are busily shepherding as many as 10 sizzling pans and bubbling pots at a time, but Doss is absorbed in the old recipe. He sifts the flour, blending in slivers of a single baked potato he has scooped from its crumpled peeling. 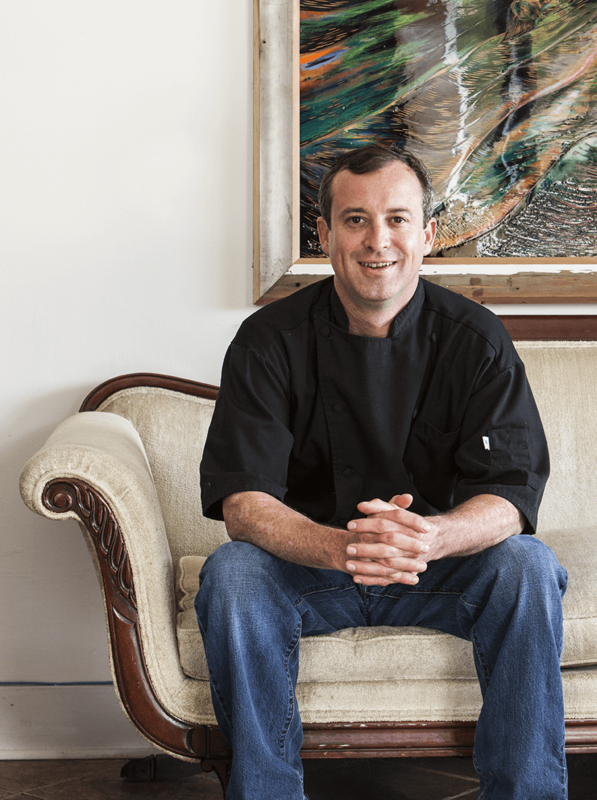 Managing two restaurants doesn’t give Doss much playtime, but he’s willing to experiment for the sake of Rx’s nouveau Southern menu, which he changes daily to emphasize the farm-to-table experience — seafood, meats, vegetables, eggs, and cheeses, as much of it as possible from local sources. On a typical night, some customers will perch on stools at the bar and watch a ball game over craft beer and chicken wings, while in booths a few feet away, dinner guests savor white sweet potato bisque with duck confit or a New York strip steak with turnips and mushrooms. 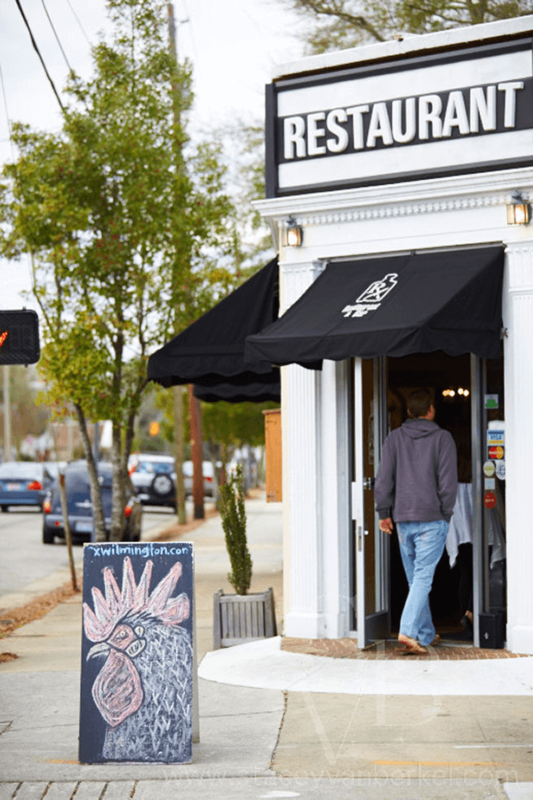 Open since 2012, Rx sits at the center of the downtown Wilmington community called Dry Pond, a name with an origin so murky that locals simply agree there must have been ponds in the area way back when, which, at some point, probably dried up. Only blocks from the heart of the city’s popular historic area, the aged houses here scrunch up to the Castle Street Arts and Antiques District, a nest of eclectic businesses that make neighbors of an art gallery, a wine shop, a convenience store/fish market, and a cluster of antiques shops, including one in a whitewashed old church. Rx hugs the corner of Castle Street and Fifth Avenue, in a building that housed Hall’s Drug Store for most of the 20th century. The pharmacy’s name still stands high on the beige stucco exterior, and customers approaching the restaurant’s glass front doors might get the feeling they’re heading in for a prescription from days gone by. In a way, they are. Doss and his employees — including his brother Will — have adopted the labor-intensive, old-fashioned methods of country kitchens, which the Dosses know from their upbringing in Goldsboro. The cooks butcher pigs and chickens, make sausage, put up butterbeans and blueberries, and pickle green beans. 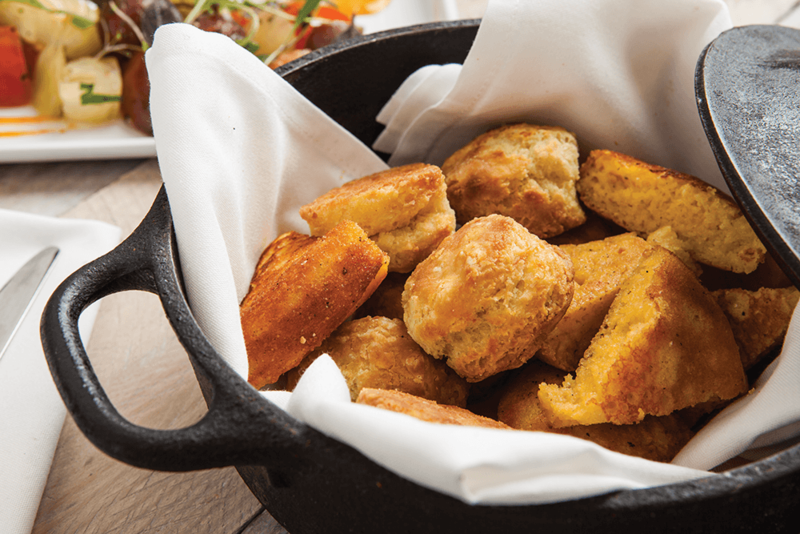 They shell shrimp, clean fish, and bake biscuits — and if all goes well tonight, potato rolls, too. 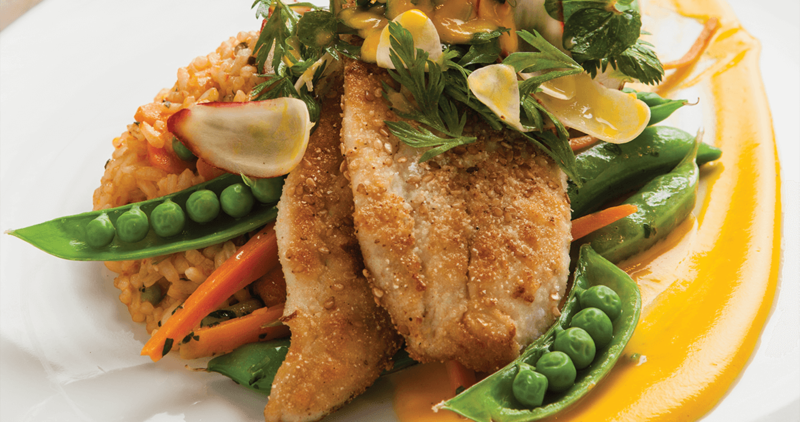 Rx’s Nouveau Southern menu changes daily to emphasize the farm-to-table experience. Doss adjusts the menu with the seasons, depending on what’s available from area farms. During the summer, for example, Rx’s signature shrimp and grits might include fresh corn, tomatoes, and bacon. In the winter, Doss uses fennel, mushrooms, and andouille sausage. Rx links to its pharmacy past only in subtle ways — a mortar and pestle set stands on a shelf in the bar, and the menu is superimposed over the outline of an apothecary bottle. The name itself is pointedly pharmaceutical, with a crossed knife and fork forming the x. Dark chenille curtains and wine-colored accents lend the restaurant a quiet, low-light ambience, and the walls serve as a rotating gallery of local art. The bar and tables are made of reclaimed lumber — from a farm, of course. Four hours after transcribing the potato roll recipe and muscling out the dough by hand because the electric mixer couldn’t do the job, Doss pulls a pan of golden orbs from the oven. He hands one roll to Will and takes another for himself. The brothers tear open the crusts and lean in to smell the warm bread. Then they take a bite and get a taste of their family’s past. “Needs more salt,” Will says. Doss goes to his paper and doubles the salt. Then he walks to the other end of the kitchen, returning with two rolls loaded with sautéed shrimp and a dollop of coleslaw. One bite of this buttery, salty, sweet, slightly spicy combination, and it’s clear that Doss — and his grandmother — have created a winner. Tim Bass is a former newspaper reporter who teaches creative writing at the University of North Carolina Wilmington.